Lenovo is the absolute leader in the Chinese laptops market and is one of the top brands in the global notebooks market. One of its best-selling models is the Xiaoxin. Today, the manufacturer announced the more affordable variant of this product, namely the Lenovo Xiaoxin Lite. The Lenovo Xiaoxin Lite (aka Youth Edition) is equipped with Intel’s eighth-generation Core processor, 128GB SSD+1TB HDD combination hard drive, and 8GB memory. 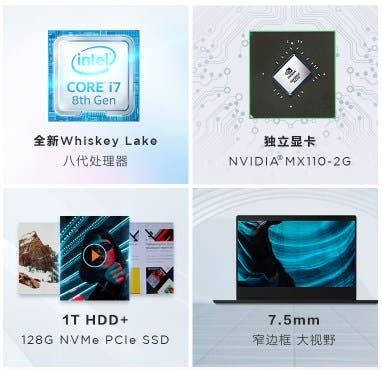 The i7-8565U processor version is available for 4,999 yuan ($745). This simply means it is quite competitive if taking into consideration the specs list over the price ratio. As a product that focuses on young users, Lenovo Xiaoxin Lite comes with a fashionable look. It also weighs 1.6kg, has a 7.5mm double-side narrow frame, a 19.9mm thick body, and the metal wire drawing process ensures a stylish appearance. The body color has both silver and black options. 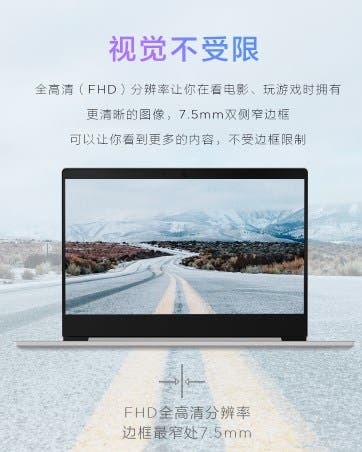 Apart from this, the Lenovo Xiaoxin Lite is also equipped with a 14-inch screen, which has a resolution of 1920×1080 and a maximum brightness of 220 nits. It is worth mentioning that this notebook has achieved 180° full tiling. It is convenient for daily content presentation and avoids damages caused by operation mistakes. 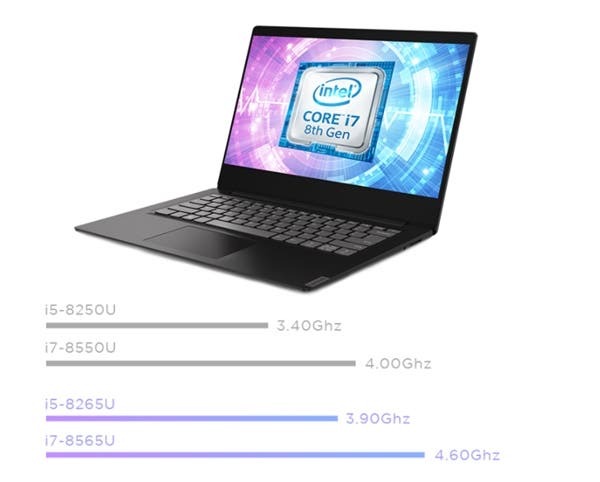 As said, the highest version of the Lenovo Xiaoxin Lite is equipped with Intel’s Whiskey Lake architecture i7-8565U processor, which has the parameters of 14nm process node, 4 cores and 8 threads, and TDP 15W. By the way, many Intel Core i7-8550U processors were released in Q3 2017, while the Intel Core i7-8565U processors are released in Q3 2018. The highest Turbo frequency is also upgraded from 4.0GHz to 4.6GHz. There is also the NVIDIA MX110 2GB discrete graphics and a 35Wh battery that can support up to 6 hours of battery life. 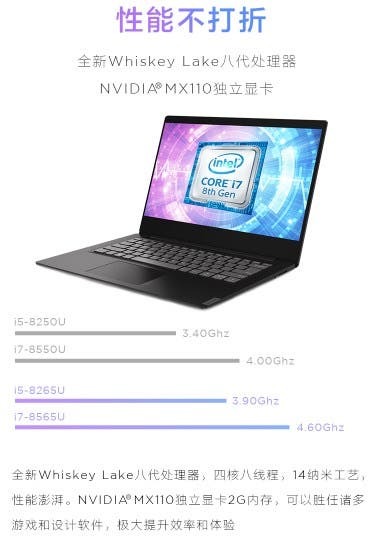 In addition, Lenovo Xiaoxin Lite also has the Intel Core i5-8265U processor version, which is packed with the MX110 GPU, 8GB memory, 128GB SSD + 1TB mechanical hard drive, and is priced at 4599 yuan ($685). As a lightened version of the original model, the Lenovo Xiaoxin Lite does not compromise on audio and video, supporting Dolby sound effects as well as 2 × 1.5W high-power high-fidelity audio. Thus, it will be ideal when watching movies, listening to music and playing games. At last, in terms of interfaces, this notebook has two USB3.0 ports, one USB 2.0 interface, a 3.5mm audio interface, a card reader, an HDMI interface, a power dock and so on.